My Blog has been showing sitelinks on Google quite often. All I did is illustrated as it is in this tutorial. The only thing you have to do is follow the steps Exactly as I demonstrate. 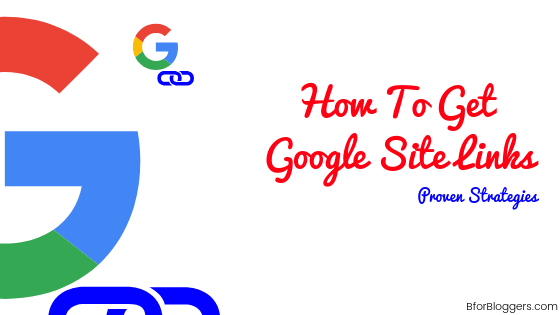 Though generation and output of Sitelinks are automated, there are few things which contribute and help Google in providing the favorable results fast. In this post, I will show you some proven steps and strategies that actually work for getting Google sitelinks. 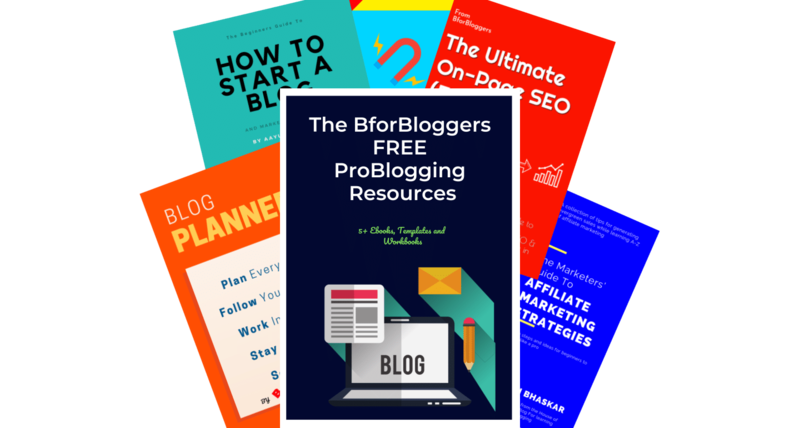 I have tested these strategies on my blog and they did great for me. Follow these rules and soon enough you will see those links appearing on your pages in Google SERPs. Sitelinks are meant for enhancing user experience. They are added automatically by Google. However, you can follow these specific steps to complement the Google’s workflow and get sitelinks for your sites faster. While using A free theme from WordPress theme repo My blog didn’t show up any sitelinks on google and i analyzed my theme structure and found my theme didn’t have any site navigation element schema markup. 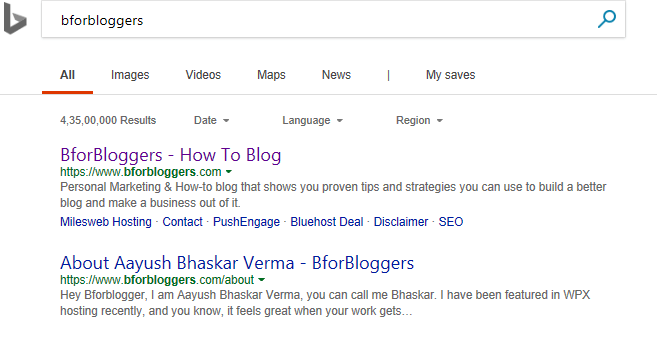 BforBloggers shows 6 sitelinks on google without even entering the domain extension. Even my individual posts are showing those beneath them in SERPs. I changed the theme completely. I switched to a custom theme that was already coded with the latest schema.org codes and was SEO optimized. The theme is easy to navigate and clean supporting Google to do its work easily. Genesis has pre-embedded site Navigation Schema Element that helps search engine to crawl easily through your main taxonomy links hence resulting in faster and better index. Different themes handle h1 and other heading tags differently. You would use <h1> in one theme which might turn <h2> in the other. All of these factors will directly affect your SEO. A proper, clean coded theme with the required schema and SEO optimization is required at all cost. Themes also affect your overall loading speed and starting from some day in July, Google will take speed as a ranking factor for smartphones as well. Earlier, this applied to desktops only. However, Google clearly mentions if someone has got a quality and relevant content with proper structure, they may still rank higher despite having a slow site (but you need to be as fast as you can). But you should keep an eye on it. It could also degrade the UX of your website. Make your website fast and impress your visitors with a beautiful and structured SEO friendly theme. This is highly recommended. I was experimenting with different sites and their structures on the web for 3 weeks now. What i found was quite surprising, and you should pay attention to this. These two posts are from the same blog. One appears to have sitelinks below the result while the others don’t. Google thinks that these headings are something the searcher would be looking for and hence it shows them in the search result itself. When I visited the second article, i.e. The one which is having the links, I found a table of contents just above the first heading which will help the user to easily navigate the different headings and subjects. The first article didn’t have any table of contents in it and that’s why I feel it didn’t show up any extra sitelinks on SERPs. A table of content is basically hyperlinks which consists of all your headings properly structured and organized by simple <ul> tags. These are hyperlinks which are generated to help user scroll faster through long contents. A UL tag is an abbreviated form of an unordered list. This HTML tag is used to add bullets, discs etc. To the selected content in your article. This doesn’t include numbers. We use <ol> tags for adding numbers. Google can quickly catch up with the links you provide to it via a table of contents tab and that’s why sitelinks appear on such articles. Structured data is a key to success in SEO. you should focus on properly executing your data with HTML too. Focusing on visual appearance do adds value to visitors but the real work will happen via HTML only. According to my studies, it is possible to get sitelinks quickly with these tables. The live example contributes a lot to this fact. you can add a table of contents through minimum HTML coding But beginners might feel very uncomfortable doing it. The easier way to do this is to add a plugin. It might be that Google follows the user flow and tracks on how the user interacts within the webpage. Table of contents provide immediate action and a user can easily select the topic as per it’s interest and needs. Google might just hook that up in SERPs. It’s like when Google feels that users are clicking through your table of contents links, it shows them up on the front end for a better experience. 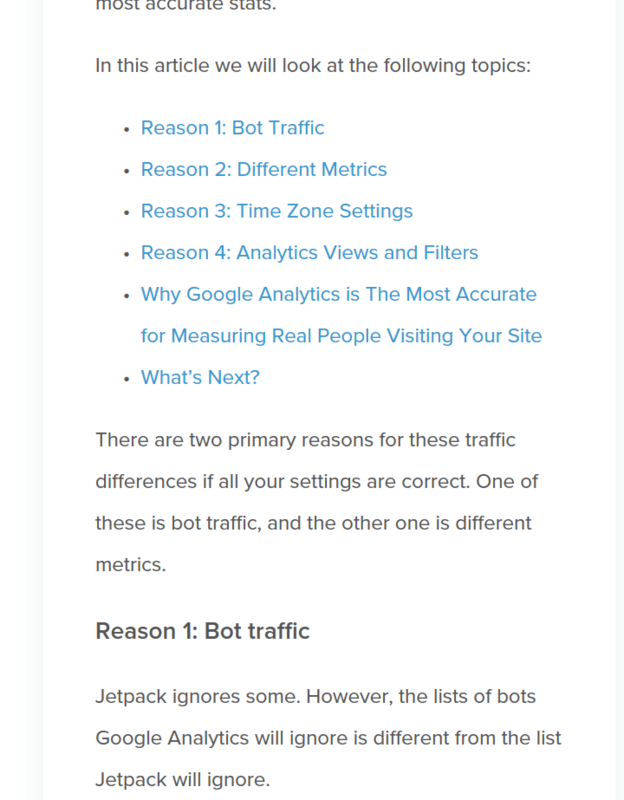 Go ahead to Google search and type “Jetpack vs Google analytics”. 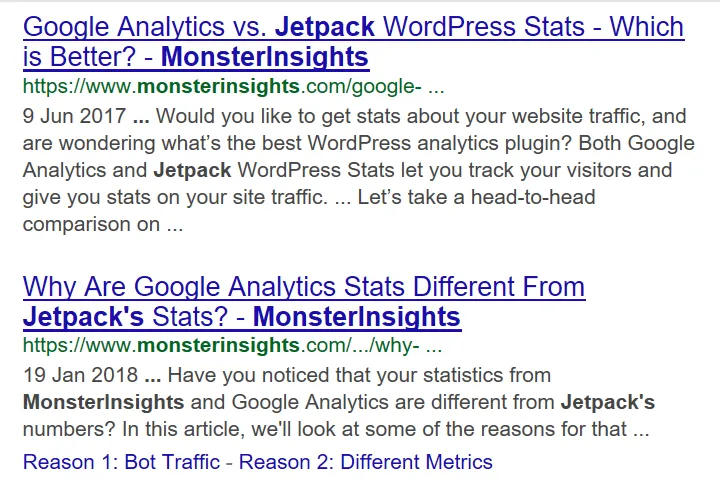 My post shows post specific sitelinks and guess what? All I did is mentioned in this article. Keep reading. I strongly recommend adding a table of content plugin for your WordPress blog. Here’s a great free one. Without further elaboration, let me give you a three-step blueprint for a highly effective SEO friendly content. First, start with an introduction. Introduce the brand, technique, product or anything you are going to write about and give a brief insight into how you found it or whatsoever. Second, Make sure you begin with an <h1> or <h2> tag. Depending on the title, make a habit of using heading tags instead of simply enlarging the titles. Make sure you don’t use the focus keywords in h1 tags. Use correlating words or phrases instead. You can use the keyword in h2 tags once only. Third, Use break lines with contextual words that are eye-catching features, reasons and questions related to the content. Use break lines such as “6 benefits of getting sitelinks” or ” what are the benefits”. Google says “sitelinks are shown when Google feels the user will be looking for it or may find it useful”. As soon as you start giving what your users want, the google will lift you up. Your content should be original and informative. 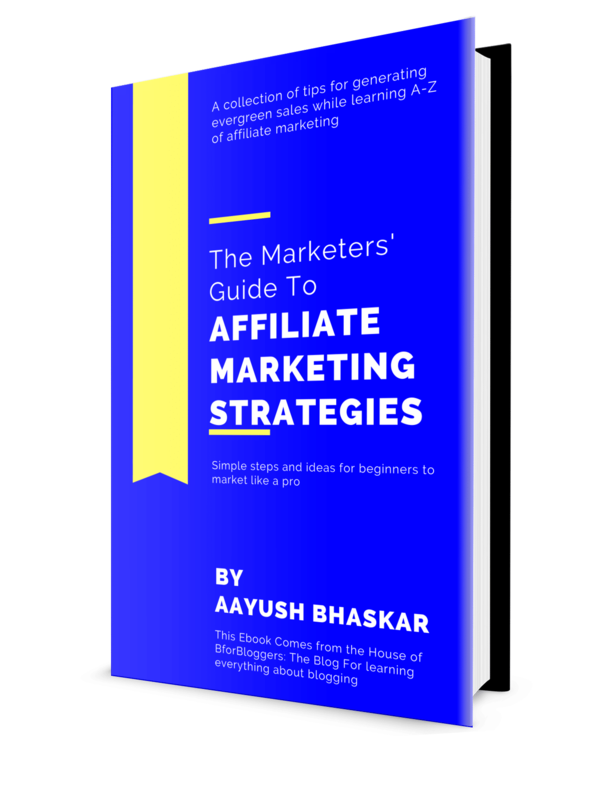 This blueprint is enough to help you with getting sitelinks. Make sure you write a highly informative post that covers up every side of the topic. I have seen on google that only long and properly titled and structured content is rewarded so make sure you do this. Always write the way you would want to read as a beginner. Submitting a sitemap to Google is extremely important. Not in it helps you get site links, Its the first step you should take to help Google better crawl and understand your website. For doing this, Go to your WordPress dashboard and install the “Yoast SEO Plugin“.After the initial setup, this plugin will automatically create a sitemap for you. You can access it by going to the link: “www.yourdomain.com/sitemap.xml”. Now, to submit it to Google. Go to your search console and select the property. Then in the crawl menu select sitemaps. On the above right corner click on the Add/ Test sitemap. Internal linking – Internal linking is a must to do practice for any blog. Not only this helps Google understand your content better, it also helps your audience to navigate on your blog more easily. Link your most important articles with every related post so that Google gets to know you want to put it on the main frame. This will help you generate a better structure and User experience too. There is no shortcut to getting sitelinks. You cannot force Google to show these. However, you can follow these simple best practices that will ensure google follows you the way you want it to. Be honest with your audience and add value to your content. Don’t pretend to know the thing you don’t. Also, remember that sitelinks add indirect value to SEO. this means it does possess an effect on it. As far as I have gone through the traffic does affects how fast you are going to get sitelinks on your SERPs. Google follows the click made by your visitors on your article. The more you write helpful articles with QnA segments, the faster you are going to achieve success with these. Probably the structure is a key right now. The unique branding and unique domain and its authority have nothing to do with sitelinks. However, you need to rank first for your brand name. Breadcrumbs as far as I have seen give a little boost to the procedure. However, this isn’t necessary to have. Almost every premium, as well as quality free themes, comes with a pre-loaded breadcrumbs navigation so this shouldn’t be a concern for you. You can check out if your pages support breadcrumbs via the structured data testing tool by Google. Yes, this is an absolute fact. Unless and until you are acquiring the first page on google for any given keyword. You are likely to get sitelinks if you are sincerely following the rules. I keep an eye on my top posts on SERPs through SEMrush and hence I got to know that the review I did for Nestify was showing sitelinks below the post. For this review, I am ranking on the first page. I haven’t seen any sitelinks appearing on any results after the page one till date. So you should be ranking on page one of Google to get sitelinks. This all happened within a week of implementing the strategies I found. I hope you would get the same results too. Having site links will increase the CTR on your articles. With more increase in the click-through rate, you can expect more conversions and higher rankings in the long term. The whole procedure will take time to show the results. This can be a month or a week depending upon the google and its crawl rate. Following the suggestions I gave you will ensure a higher percentage of getting success. In the end, it’s all about content and it’s originality. Help your users with rock-solid articles which are helpful to the core. Once you have got some, you can check your sitelinks via your Google search console. You can also remove the links of pages, taxonomies etc. you don’t want to show up. You shouldn’t change your theme once you’ve got these links. Doing so may result in the vanishing of these sitelinks. Make sure the new theme you choose is schema markup integrated and easy to render. In case you are wondering, search boxes are also a part of schema markup. Sitelink search boxes are given to those sites which are big enough to give users a result for what the will search relevant to your blog’s niche. These aren’t fixed for blogs only, sitelinks are also rewarded to websites made for brand endorsement. I strongly suggest you have a blog running under your website’s domain.